Like so many fossil dinosaurs and other life from the late Jurassic period, Xiaotingia was found in Liaoning Province, a happy hunting ground for paleontologists. The skeleton was embedded in shale, along with the clear impressions of feathers. 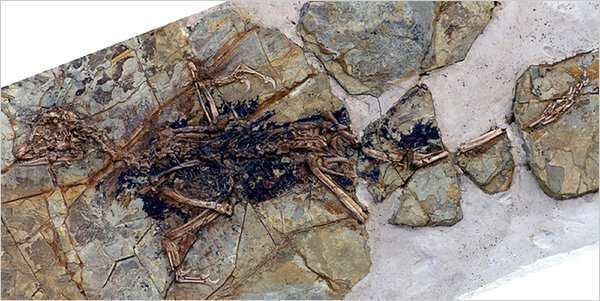 Scientists who studied the specimen said it was not as striking in appearance as several of the 10 known Archaeopteryx remains, but good enough apparently to contradict conventional wisdom about proto-birds.